Standing proudly in the heart of one of Australia’s most historic towns is The Richmond Arms Hotel. 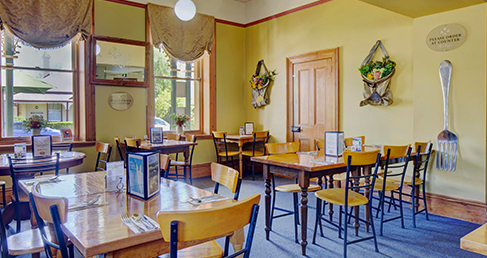 Our grand sandstone hotel combines modern comforts and old world ambiance for a uniquely Tasmanian experience. Established in 1827, we offer colonial style ensuite accommodation so you can completely immerse yourself in the history of Richmond. The original building, The Lennox Arms Hotel, was destroyed by fire in 1888. The Commercial Hotel was built in its place, and was renamed as The Richmond Arms in 1972. The Stables are the only surviving section of the Lennox Arms Hotel and have been carefully renovated to preserve the character of the original building. The converted stables feature contemporary furnishings, with bathroom facilities and can accommodate couples and families of up to 6 guests, in the Gin, Convict, Vine or Wheat units. Our Bistro Lounge serves hearty meals and snacks, including a children’s menu and great daily specials. Richmond is located one of the best wine regions in the country, so naturally our extensive wine list features some beautiful local drops. Not forgetting Tasmania’s famous produce, our fresh seafood and cheese platters are a house specialty. Relax in our Saloon Bar, which offers excellent wine, beers and ciders, TAB and Keno facilities, a pool table and juke box. Picturesque Richmond is nestled amongst the lush vineyards of the Coal River Valley and is just a 20 minute drive from the Hobart airport, and 25 mins from Hobarts CBD. Richmond Village is rich in history, with its ornate Georgian architecture, stately heritage buildings and quaint cottages. Originally established as a military township and convict station in the early 1800s, Richmond is now one of Tasmania’s most popular tourist destinations. While many of the original buildings have now been converted into cafes, galleries, museums, specialty shops and boutiques, Richmond is home to a number of historically significant landmarks that have become synonymous with the village, all within walking distance of our hotel. The instantly recognisable Richmond Bridge is Australia’s oldest surviving arch bridge, built by convicts in the 1820s. The elegant sandstone bridge was a momentous achievement for its time and is still in use today. The Richmond Gaol complex is steeped in history and actually predates the famous Port Arthur convict site. Incredibly well preserved, visitors can wander through the gaol buildings, step inside solitary confinement cells and discover what goal life was like in the 1800s. at the Richmond Arms Hotel. Richmond may be a small and quiet village, but there is plenty to do and see during your time with us. Richmond truly has something for everyone, whether you want to relax with a glass of Tasmanian wine or indulge in some retail therapy or soak up some history. Ask our friendly staff for more information. Make the most of your stay in Richmond and be sure to sample some of the wonderful wines and fresh Tasmanian produce that the Coal River Valley region is famous for. 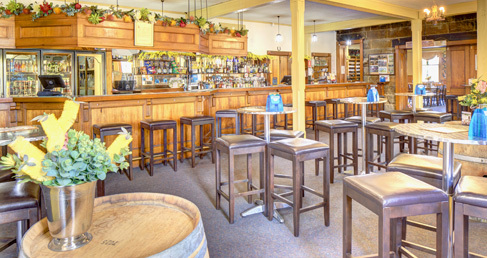 Visit our Bistro Lounge and Saloon where we offer snacks and meals for the whole family. We also offer Devonshire Tea from 10 – 12.00 noon and from 2.00pm – 4.00pm and Fresh coffee and country cakes.